Hersbruck, near Nuernberg, camp name was Camp Kathann. It was converted from a concentration camp, and it was operated by UNRRA and later by IRO. All residents were Latvians. My parents did not work anywhere outside the camp. I remember the camp well, as I was there from the ages 14 to 16. I finished the Latvian elementary school there and attended the first two and a half years of high school. My dad was the labor officer for the Latvian camp, handling the internal job assignments for the able-bodied and willing men (for extra cigarette rations -- they were worth a lot on the black market). My brother was born at the Hersbruck German hospital, where I had my tonsillectomy also. We left Hersbruck at the very beginning of 1949 for processing camps in Schweinfurt and Bremerhaven for travel to the USA. The white area at the bottom of the picture is the Strudelbad, and it still exists. The main building is the one with the black roof up by the road (Amberger Strasse). The Jewish cemetery is the lighter blurry area just to the right of the center of the picture. The Pegnitz river is at the very bottom of the photo. The camp buildings no longer exist, as the whole area has been redeveloped, and all traces of that era, being also a reminder of the earlier 'unpleasantries,' have been erased. There used to be a small brick building containing a pair of ovens next to our wooden barracks. We raised a few pigs in that building. In the center of the camp, right next to our basketball court, was a tiny Jewish cemetery. The guard towers were still existent, but we kids used them for our playhouses. There is a picture of the main building that used to house the offices, school, meeting hall, and scout headquarters at http://www.kz-hersbruck-info.de/ (website in German). The view is that which would have been directly from the front of the barracks we were in. The main road is behind that building. That picture was taken before the camps existed, back in the SS era. 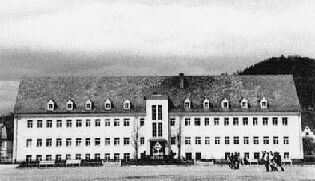 Prior to Hersbruck, we spent a year at the Amberg DP camp (in 1946), and it was at the Kaiser Wilhelm Kaserne. I remember that one quite well also. We lived many families to a room, with blankets hung on ropes to provide a bit of privacy. Refugees from many nations were housed there, but we had some exciting international soccer games on the huge soccer field in the center of the grounds. Thank you for your friendly inquiry about the Ukrainian prisoners in KZ lager Hersbruck. Since beginning our data base in 2000, it contains over 90,000 names, 90% of the arrested persons in the KZ. Ukrainian prisoners are mostly noted as "Russian" prisoners in the documents of the SS. Unfortunately, it is not possible to call up an exact number. 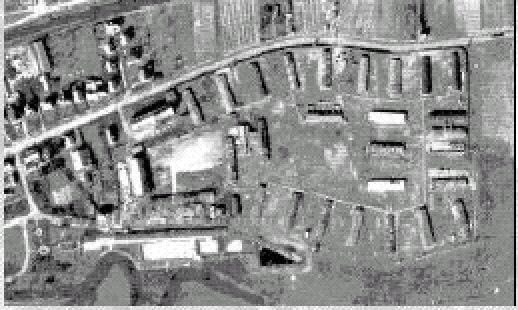 A very incomplete search result calls a number of over 1,100 prisoners from the Soviet Union for Hersbruck. Of these, only three are registered as Ukrainian. With at least 21 further we assume are of Ukrainian origin (for instance because of first names like "Petro" or "Grizko"). The correct number is surely substantially more highly. Extensive evaluations (places of birth, last residences) would have to be carried out to find more. We are sorry that we cannot give more exact information to you. City archives are located in the basement of the citizen office, where the Hersbrucker Muenzschatz was founded to 1928. There is stored treasure of knowledge, accessible to all who are interested in history of Hersbruck. City archives contain documents, books, pictures and historical documents, which permits in the distant future to reconstruct history and development of Hersbruck. How quickly such a collecti-on can be lost, the city hall fire was in 1945. At that time countless documents about the war and Vorkriegsgeschichte (pre-assembled history) of the city were destroyed. Therefore the fireproof accommodation of archives were planned and furnished, which were previously in the Emil hero house, with the change of the former post office building. The Kohl Archives are constantly supplemented. In the city administration, documents over 30 years old are segregated: Uninteresting comes into the tearing wolf, receiving value into the archives cellar. To a large extent, the users of city archives are family researchers, who search here in Hersbruck for the origin of their family. In addition, many pupils, who write a technical papers on a certain topic. The archive's property is at everyone's disposal. For the use, an archives order is issued, which spell out the exact use conditions and also fees, if necessary, resulting are regulated. Forced laborers near Hersbruck might have worked in one of these firms: Nurnberg firms employing forced laborers page is in Russian, click translate.